The fight behind the glass; Selfridges vs John Lewis! With the holiday season creeping up on us; every retailer, department store, magazine stand and waffle cart along Oxford Street have put up their creative lights, sparkly tinsel and fancy baubles to embrace this festive time of year. Having said this, there are only 2 retailers that caught my eye and are really doing it for me. Naturally, Selfrideges are in the running, because let’s face it; that’s what they do all year round. Therefore the most magical time of year is not going to be any different; and if it is, it is most defiantly going to be better-different. Moving on and about 700 yards up the road, John Lewis have pulled out all the stops to draw in every onlooker this Christmas. From the luxury haven that brought the big yellow iconic paper bag to the high street to the family-feel department store that brought us the “most adored” Christmas TV ad of the noughties; the two retailers battle for 2013’s window display lime light. Having previously been the street’s main attraction, Selfrideges’s ooh so famous window displays experience some competition as more and more passer-byers stop to snap the windows at John Lewis on London’s Oxford street. Personally, I love Selfridges’s artistic flare; and like most; I have always adored their creative efforts, but taking the bus through Oxford street everyday, twice a day; to and from work I am guilty to having looked and loved else where. John Lewis have done well. The retail giant has demonstrated creativity like no other. 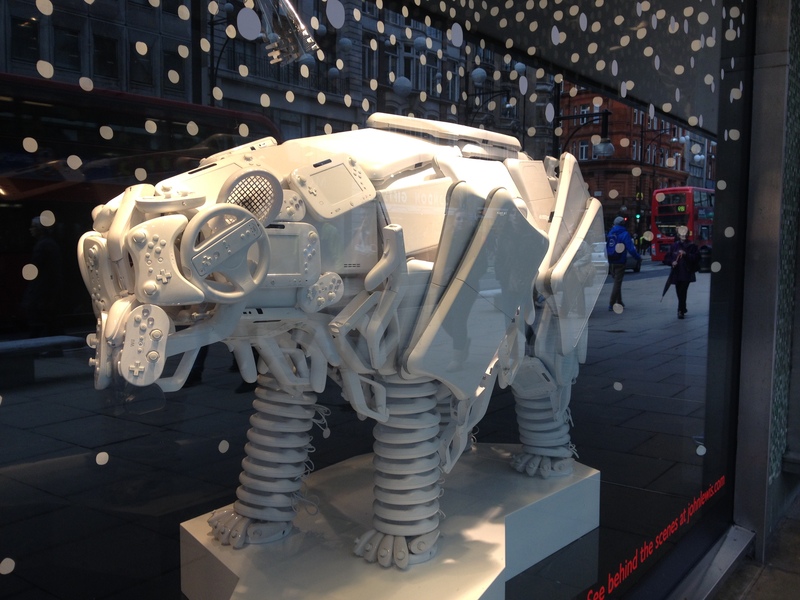 Using the simplest household utilities that include; hairbrushes, kettles, cleaning tool, hovers…(the list goes on), John Lewis have created festive creatures and sceneries to fill the display windows across their central London branch. The outcomes are absolutely amazing. Having said this and going back to the big and the yellow; Selfridges, implement snowy and Christmasy scenes throughout. 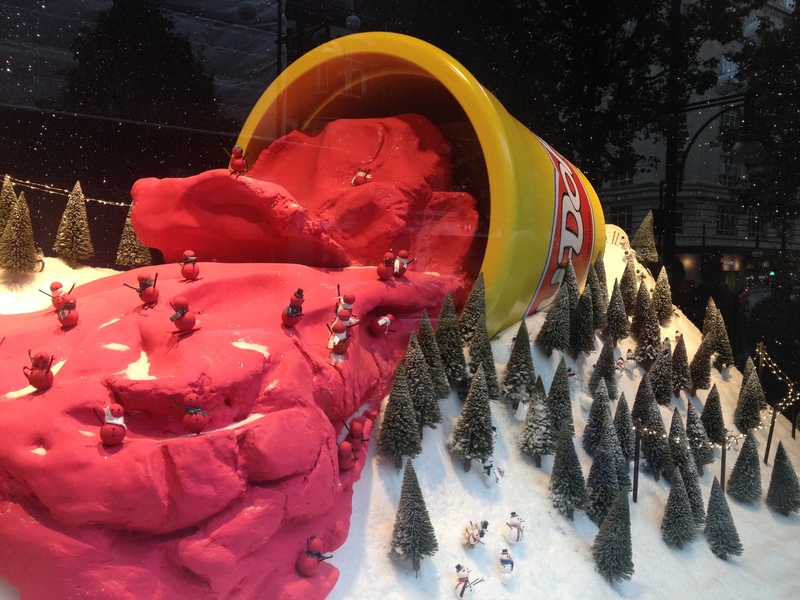 Masses of ginger bread, fake snow, even more play dough, a giant YSL clutch and a snow globe that I could fit in; are just some of the fascinating props used within the famous ground floor display windows at Selfridges. The busiest shopping district in the Capital is about to get even busier, as the Christmas rush starts. But who will get the most ratings, hash tags, likes and recognition from behind the glass, amongst the hundreds and thousands that pass through Oxford street snapping away this Christmas.